All posts under Money are for information purposes only. They are not and should not be construed as financial or tax advice. Laws change and they differ by location. Consider these posts as ideas you could take to your financial advisor and/or tax accountant for discussion. How much of your hard-earned interest, pension, and/or social security income can you keep? 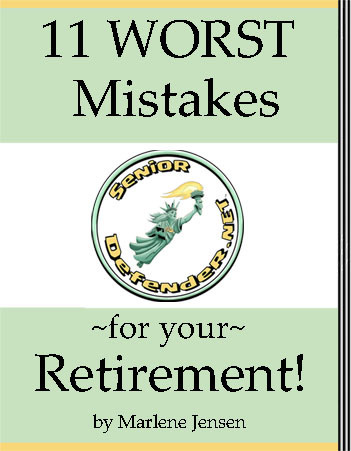 Be very careful in picking the state where you will retire. The wrong choice could cost you thousands of tax dollars — every single year! Are you better off from the Tax Cut Act? Not so fast! At first glance, seniors may believe they are better off for taxes in 2018. But it may not be true for you. Given that taxes are complex and ‘no one size fits all,’ let’s explore the new Tax Cut Act. The hype is that nearly everyone will benefit from the tax law changes but that has not been proven. For example, the standard deduction will be doubled starting in 2018. Fantastic, right? But… the personal exemptions will be phased out temporarily. Where will that leave you? Tough to say but odds are most are not better off regarding their tax liabilities. It depends a lot on family size and taxable income levels.